The new Tomi Salesvuo East Funk Attack is bursting with energy! East Funk Attack, led by drummer Tomi Salesvuo, has an updated lineup. 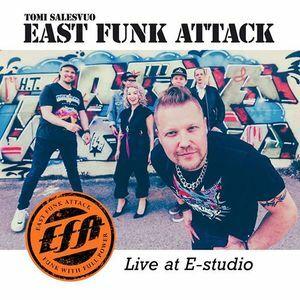 Tomi Salesvuo East Funk Attack is a Helsinki Based funk band founded in 2013. The new lineup of the group is now complete and East Funk Attack released an in- studio live music video series ”Live at E-Studio” last september. The East Funk Attack band is a sextet, and features the charming and talented singer, Taru Ratilainen. On the heels of a recent tour of Germany, the Tomi Salesvuo East Funk Attack now presents five videos of musical performances of the group. Shot and recorded live at the new E-Studio in Sipoo(FIN), the songs are an introduction of the new line-up to audiences everywhere. With this energetic band, drummer and composer Salesvuo is proud to introduce a funk collection of youngsters together with funkiest rhythm section from Finland! "Tomi has a sense of melody and groove that is not heard everyday and he manages to combine catchy vocal lines with funky hornlines and his own smoking rythm-keeping, making this album a very fine example of music- not just made in Finland but made for the whole world to hear." Tomi Salesvuo is a drummer, bandleader, producer and educator based in Helsinki, Finland. Born and raised Lappeenranta Finland, Salesvuo has been an avid student of the drums since his early childhood. After graduating from the Sibelius Academy in Helsinki, Salesvuo’s performances with Wayne Krantz, Jim Beard, Benny Golson, Peter Weniger, Nils Landgren and Inaki Sandoval have played an important role in Tomi’s career. Tomi has performed and/or recorded with top Finnish artists like XL, Pekka Pohjola, Severi Pyysalo, Jukka Perko, Jukka Eskola, Pekka Kuusisto, Osmo Ikonen. Tomi Salesvuo teaches at the Helsinki Metropolia University of Applied Sciences as an associate professor. In addition to performing internationally, Salesvuo has taught drum set master classes in many european countries, as well as in the USA and Canada.